That video has nearly 73 million views now! I have a very soft spot in my heart for 90s Europop music. That guy's pretty good. It always amazes me when people cover Megadeth well because Dave Mustaine's music is so difficult to play unless you're really plugged into his writing style. What's worse than her singing is that black man trying to rap. Amon Amarth just came out with a new CD last month, I think. Went to Best Buy after leaving church to pick it up...my husband is in 7th heaven right now (Sorry, AA fans, but my ears kind of hurt ). We watched Metallica music videos and had a few beers all night yesterday. LOL I'm sure you would get along. A Pro-Life reggae "dub poetry" song that I made with my wife a few years ago. Finally got the Karmacode CD, but I can't listen to the rest of the songs because I like this one too much. 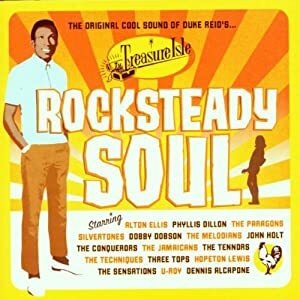 Right now, "Ba Ba Boom" by the Jamaicans, on Rocksteady Soul, a compilation of Jamaican rocksteady from Duke Reid's Treasure Isle label. Sorry, had to make the joke. So how is it? LOL! I just might have to do that for one of my own personal rocksteady compilations! It's wonderful, although, like most of these newer Trojan Records comps, it's most of the same songs that show up on all these comps with a few rare or as-to-yet unreleased songs. Since I love just about everything Duke Reid touched between 1965 and 1971, this is right up my alley. ONe of my wife's friends was just telling me about this show this past weekend using this episode as an example. Thank you for reminding me to check it out! Its seriously hilarious! You should run to check it out. My favorite character is this hipster, gauged ears, fixed gear guy. For anyone who loves symphonic metal, the new Within Temptation CD is not to be missed. I can't stop listening to it. Shot in the Dark is the best song, IMO. ^If I may ask, what type of vocals does it have? Doro Pesch and Udo Dirkschneider - "Dancing With an Angel"
Two German metal singers doing a ballad in English. Amazing. Well, yes. Compared to the female vocalist Arch Enemy, the singer from Within Temptation is most certainly operatic. Hm, clear, yes. Operatic? Not so much. She isn't like Tarja-era Nightwish. More like Delain. Thanks I can't count how many times I've wanted to like a band, and then I heard the vocals and it just ruined it for me. Some days, programming my bi-weekly podcast is a delight. This is not one of them. Thankfully, songs like this make it worth it. I'm not playing this particular one (I think I've settled on "Here to Stay") but listening through the Sheer Terror catalog has made a relatively stressful day that much better and easier to deal with. I recently got a CD of Beethoven's late Choral Music (excluding the monumental Ninth Symphony and Missa Solemnis) and I'm absolutely glued to this one charming (yeah, I know charming doesn't really characterize Beethoven's music) piece called the Bundeslied (op. 122) which is scored for 3 part chorus, 2 soloists, 2 horns, 2 bassoons and 2 clarinets. The text is a poem of Goethe about the joys of enjoying others' company. 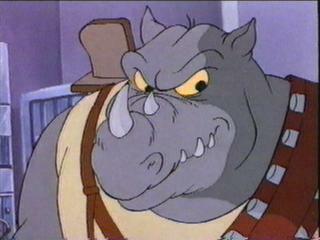 I'm not mistaken, that's Rock Steady from the original Teenage Mutant Ninja Turtles cartoon. Oh, the joys of forgotten youth. Indeed it is. And indeed they are! I've never been a big fan of BtA, and this album doesn't seem like it's going to change that. Still, there's some interesting bits here and there. I bought several new (2011) albums today, this being one of them. As with BtA, I've never been a big fan of this band, but figured I'd give their new material a shot.